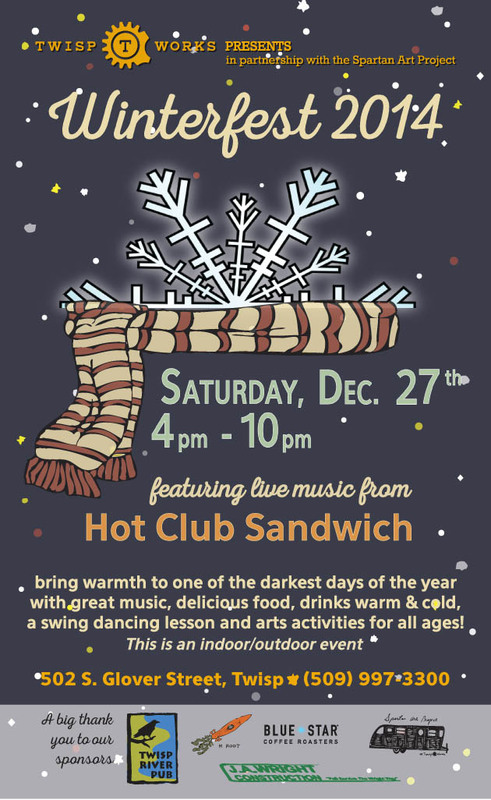 On Saturday, December 27 TwispWorks will host the third annual Winterfest from 4pm to 10pm. Aimed at bringing warmth and light to one of the darkest days of the year, Winterfest will feature live music, food, drinks, and activities for those of all ages. Seattle gypsy-jazz string band Hot Club Sandwich will lead the way in sparking attendees’ toes to tap. The six-man band plays everywhere from Alaska to Pennsylvania, combining classic Latin American, old-world European and a bit of West Coast twang in a unique musical style. Prior to their concert, Hot Club Sandwich will offer a swing dance lesson. The 30 minute instruction will start at 5:30 and will be suitable for all ages and skill sets, so bring your dancing shoes! Winterfest will also feature interactive arts activities. Natural dye artist Sara Ashford will teach participants how to do “shibori” (AKA tie dye), a Japanese technique of binding, stitching, folding, twisting or compressing cloth to make patterns. Using t-shirts provided, participants will soak their shibori wraps in indigo dye before taking them home to reveal the final effects. The Twisp River Pub will be selling an array of hot dishes. Beer, mulled wine, soft drinks and hot chocolate will be available for purchase. Admission is by donation. A donation of between $10-$20 is suggested for adults; kids under 16 are free. This year’s Winterfest is sponsored by Twisp River Pub, KTRT, JA Wright Construction, Blue Star Coffee Roasters and the Spartan Art Project.